The Woolsey Fire, the most destructive fire in Los Angeles County history, began on 8 November 2018 and quickly grew to 14-mile fire line that burned 97 000 acres and destroyed over 1 600 structures across a number of LA communities. The three Sikorsky Firehawk aircraft totalled 120 flight hours and 350 water drops during the first seven days of the fight against the fire. Aircraft maintainers worked around the clock. 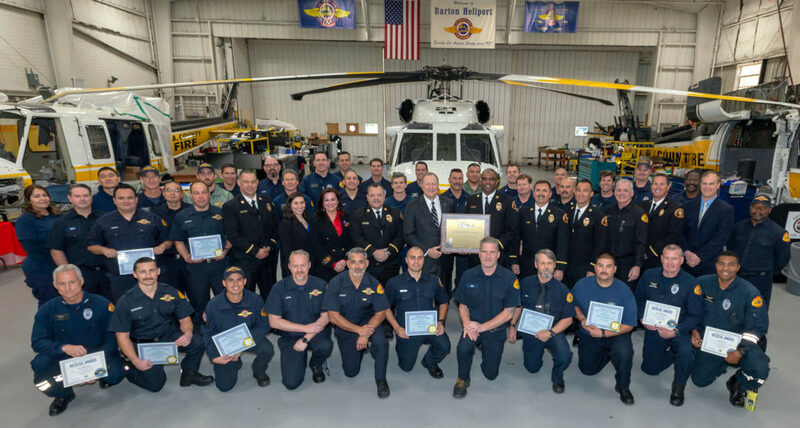 On 11 February 2018, Sikorsky President Dan Schultz presented the Sikorsky Rescue Award to 35 pilots and crewmembers, as well as the company’s Superior Maintenance Award to 21 members of the fire department.